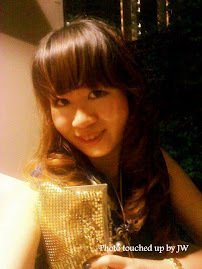 Thanks Sample Store for the lovely Giftopia event held at Raffles City. Giftopia is a movement to bring back the joy of sending hand written postcards to our loved ones. Think of those good old days before emails, facebook and whatsapp messages became a norm. What an awesome idea to re-connect and surprise our loved ones! Sample Store have recently revamped their website too. Check out their new site: https://www.samplestore.com/ One of the most popular booths at Giftopia was the sure-win spin-a-wheel Sample Store booth that everyone would win a sample after filling up a feedback form on the newly revamped Sample Store’s website. There were plenty of things to see and do at the Giftopia event. 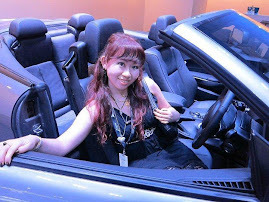 Being a beauty addict, I had a beautiful sunday exploring and discovering various interesting beauty products from Taiwan and other countries. Giftopia is an awesome event whereby the vendors threw in amazing discounts. Well, one basically gets the best of both worlds at Giftopia: a wide variety of beauty products at pocket-friendly prices! Posted this photo on my instagram which attracted plenty of interest: The door gift from Sample store, which contains a wide assortment of interesting beauty products. I kept wondering why did my Giftopia tote bag smell so sweet until I noticed the Dinobay air fresheners (Strawberry and Bubble Gum) in there (not to mention the really cute packaging :D). The next cute beauty product which caught my attention was Cathydoll Ready 2 White - 2 in 1 Bubble Mousse Cleanser from Karmart. 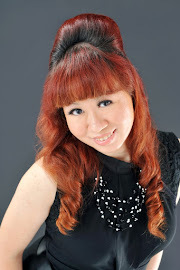 The Cathydoll Lip Smile - Dragon Fruit Vit B Lip Perfume has a sweet bumblegum scent too. The Cathydoll 99% Aloe Vera & Snail - Serum Soothing Gel looks interesting too. There was a pretty pink rose moisturizing essence mask from My Beauty Diary. So happy that my Giftopia bag contained all the sweet smelling pink beauty products. I'm such a sucker for sweet smelling and pink products. 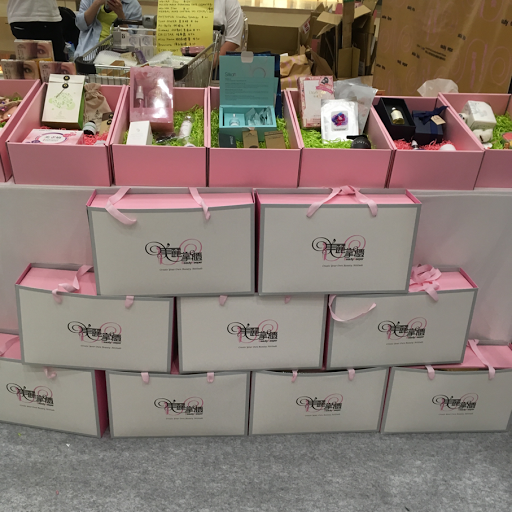 I'm a fan of Taiwanese beauty products and spent most of my time at Beauty Keeper booth. 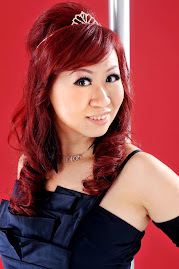 Beauty Keeper is an e-commerce site which offers the best of Taiwanese beauty products: www.beauty-keeper.com is the one-stop site whereby you can find the most innovative, novel and award-winning cosmetics and skincare products from Taiwan. Although the company is based in Taiwan, the good news is there's free shipping for international orders. All Belle Eyelashes are artistic designs of eyelashes which can help you to stand out from the crowd at a party. Miss Hana No Smudge Waterproof Eyeliner is a set of 4 pencil eyeliners in easy to wear shades of brown, grey, navy and black in a pretty pink metallic box. Minorca Ideal Flawless Beauty Cushion Mousse (black round container) smoothes skin and has oil-control properties. The pretty pink Anion Skin Towel, which is made of synthetic micro-fibre and germanium, cleans pores, removes blackheads and clears clogs. PSK Pearl CC Cream (white round container) has 95% of skincare ingredients and contains pearl powder and gold seaweed so using this make up is like some kind of skin treatment. I was given a sachet of Forever Young Yoho Power to consume on the spot. The probiotics enhances the effectiveness of the collagen and one can take it on its own without mixing in any water. And unlike many collagen supplements in the market, this product actually tastes good! Phytopia Slim Way Synergy is a natural appetite suppressant which is made of organic essential oils. I find it interesting cos most appetite suppressants are meant for oral consumption but Phytopia Slim Way Synergy is meant for topical application onto problematic spots such as tummy and thighs. I like the inspirational quote on the earthy green Phytopia packaging: "Change starts with me". 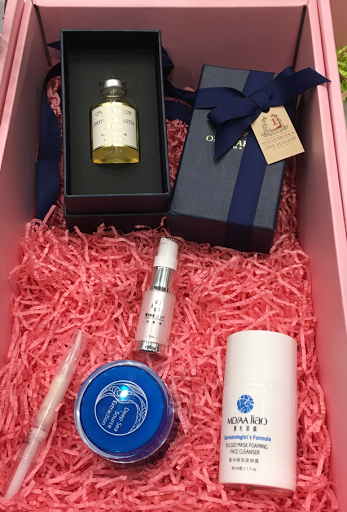 There's no way that a pink fan like myself can possibly miss out on the pretty pink packaging of Crisstar Oxygen Hydrationist Skin Repair set which contains natural plant extracts and is created for sensitive skin! Crisstar Hydrationist Energy Aqua Essential Gel contains 9 peptides which can stimulate collagen generation and biological hyaluronic acid which deeply hydrates the skin. Jan Dan Rose Facial Essence (bottom left in the photo) is a toner which contains rose essence and organic aloe vera and zemea. The organic aloe vera can speed up skin cell turnover rate and stimulate collagen and elastin production. 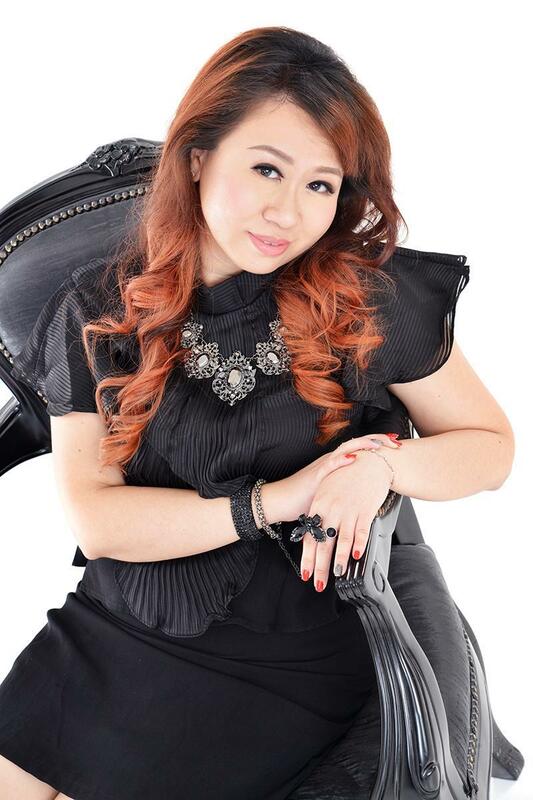 I like the light rose scent and light texture which is easily absorbed by the skin. Aurelia Aurita QQseries Moisture Jelly Toner (bottom right in the photo) is the revolutionary toner in the gel form! 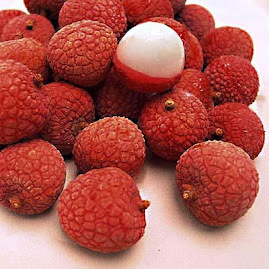 It provides deep hydration and skin repair and soothing properties. Silkah Frozen 18 (top in the photo) is powered by stem cell technology and introduces various growth factors and cytokines to activate rejuvenation of fibroblasts to solve skin aging problems. Mdmmd Water Drop Cream is a 3-in-1 Skin care product: toner, serum and lotion in a single product which is very suitable for our busy urban lifestyle. It is 100% oil free and some of its ingredients which caught my attention include: Yeast Extract【Drieline】, Acetyl Hexapeptide-37 and Niacinamide. Mdmmd Upra ® Age Delay Revive Toner slows down skin aging and improves cell metabolism. The multiple award winning Shan Camellia Essential Intensive Hair Oil (small brown tube) contains naturally extracted premium oil which penetrates deeply into hair cuticles and tames frizz and increases repairing abilities. Contin Plant Extract Shampoo is a patented shampoo which maximizes the effectiveness of garlic and is so popular that the Beauty Keeper booth ran out of it by the time I reached so I don't have the opportunity to try it out yet. Bravura Essence Mask is an exclusive refined wood pulp facial mask which has whitening and moisturizing properties. And the pretty pink packaging is so alluring. Sevynal Brightening Firming Repair Mask contains peptides and EGF and has tightening and repairing properties. One Makeup Phyto Collastin (top in the photo), which comes in an elegant navy blue box, is made in Germany and contains Patented formula that rebuilds skin structure. 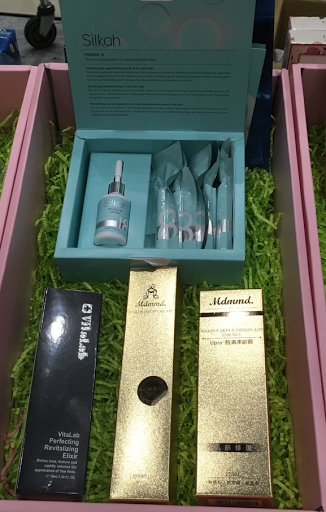 MD/AA Jiao PULSED MASK FOAMING FACE CLEANSER (bottom right in the photo) is acid free and antibiotic free created by dermatologist for oily yet sensitive skin. It oxygenates skin deeply and balances the oil and moisture in the skin. 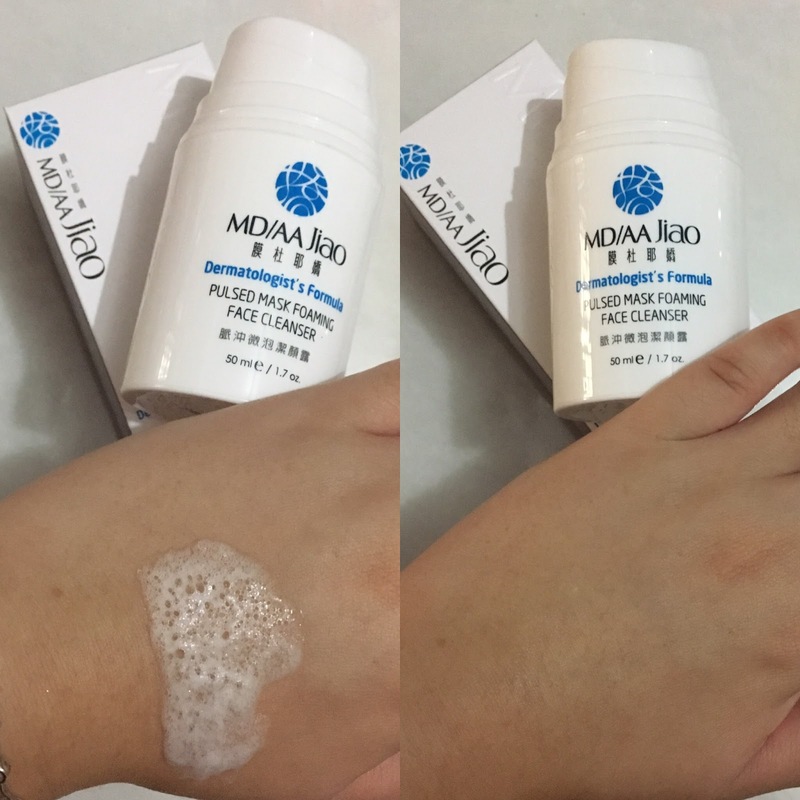 I tried this cleanser and loves how it cleans the skin very cleanly and leaves my skin with a natural glow! MD/AA Jiao HERBAL ACNE CONTROL SOS STICK (bottom left in the photo) is an Antibiotic free and Emergency Remedy for Acne. Home Love Eyes Light (white container in the middle in the photo) is great for relieving eye fatigue and contains Astaxanthin, B-Carotene, Protein peptide and Collagen. P.Seven Eau De Parfum is Taiwanese Tea Perfume which integrates the freshness and classical charm of Taiwanese tea. 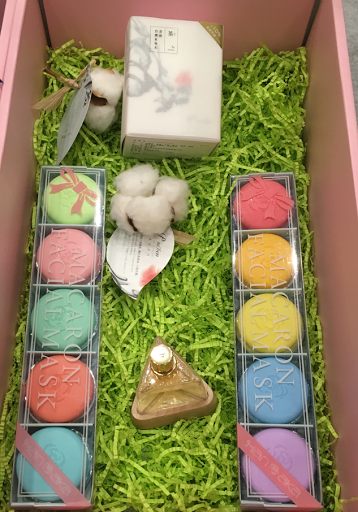 And can you believe that these pretty colourful macarons are actually facial masks?! 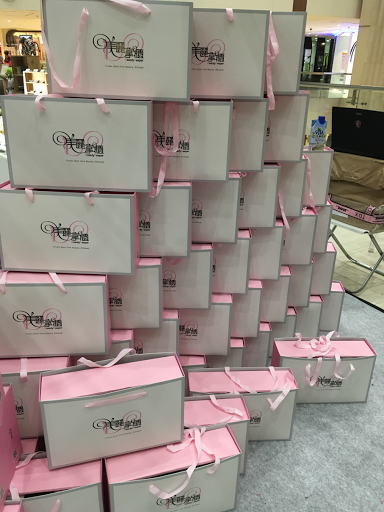 The stack of pretty pink boxes at Beauty Keeper booth! 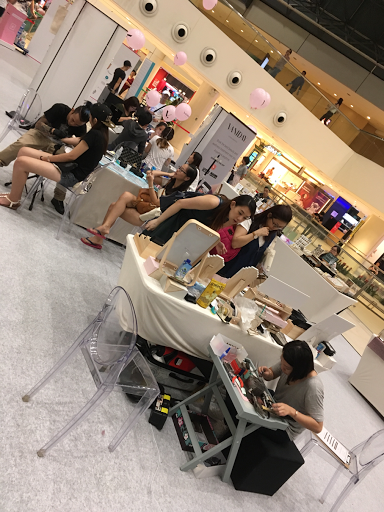 There was a Vaniday booth at Giftopia, offering express manicure services. Saw a queue at another booth offering temporary ink tattoos. There was also a Singpost booth where mail packaging of various sizes were on sale. There were many booths selling handmade accessories and cute toys and papercrafts too. It was a pity that I had to rush off for other commitments and didn't have time to explore everything. 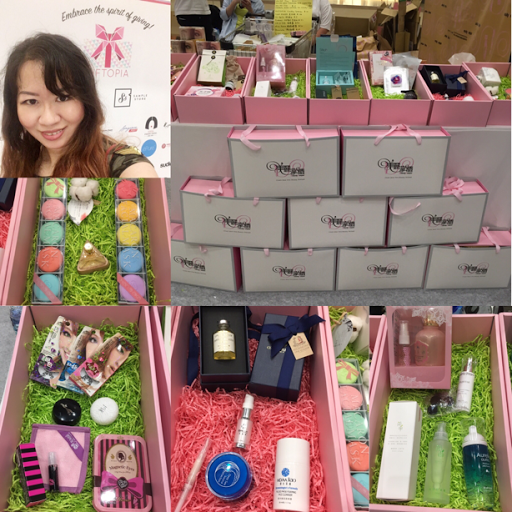 Here's a flatlay of some of the sweet pink Beauty Keeper beauty treats from Giftopia event which has attracted interest on my instagram. Thanks Beauty Keeper for all the lovely beauty treats. Shall be doing more detailed reviews on more of the products in my beauty box. Stay tuned for my updates! 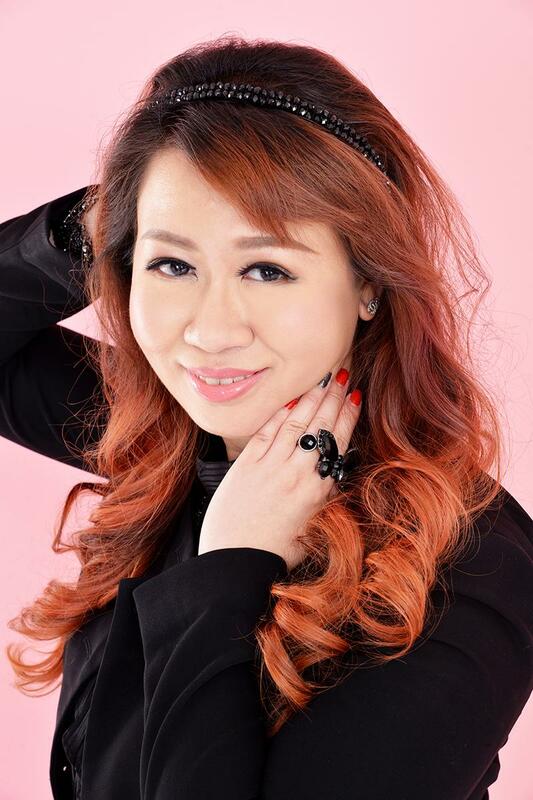 I wore these All Belle false eyelashes to the recent Singapore Fashion Week and I like how natural-looking, soft and comfortable they are. 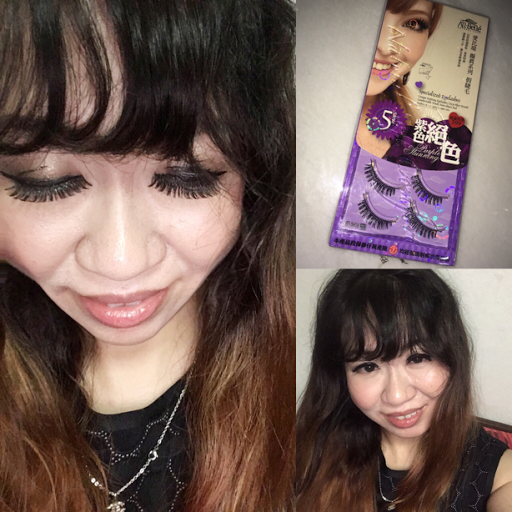 The quality is really awesome and I could reuse each pair of false eyelashes multiple times! These are no filter photos! See how dolly these eyelashes look! 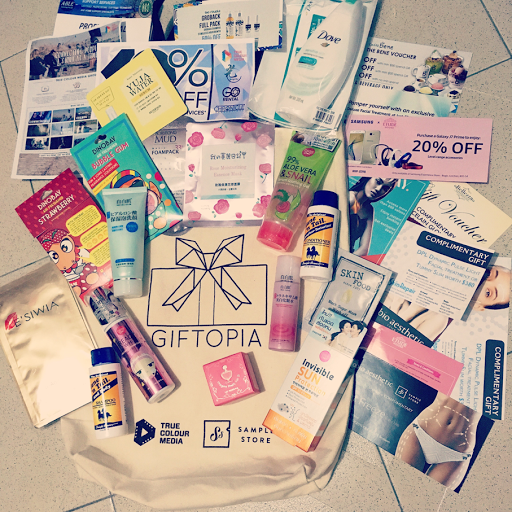 Thanks Sample Store for hosting this awesome Giftopia event, during which I discovered many hidden beauty gems and thanks Beauty Keeper and Karmart and other sponsors for sharing more about your beauty products.